With the Heavenly Father, in his wisdom and divine providence, having placed in our care such a great abundance of Keurig ® coffee makers, how might we steward said appliances such as to maximize God’s glory and our enjoyment? Here are the two ends for the Keurig ® coffee makers : I. The glorifying of God. II. The enjoying of God. We glorify God by enjoying all of his creation. By good and necessary consequences we are able to deduce that everyone enjoys coffee. Well, everyone except for tea and Diet Pepsi drinkers, which is a subset of the population to be discussed at a later date. We glorify God by propagating the gospel. In order to propagate the gospel two key elements must exist (a) willing and submitted individuals to share the gospel and (b) the resources to support their work. The scriptures tell us that no one seeks God. Therefore, unrepentant sinners do not typically go to church. This means that in order to share the gospel with the unrepentant sinner, Christians must exert strenuous effort in order to seek them out. It is observed that saints and sinners can be found congregating in close proximity in coffee shops. It is also observed that saint and sinner alike are willing to exchange money for coffee. Money is a resource which can be used to glorify God by funding (a) local expressions of the Bride of Christ and (b) foreign missions. 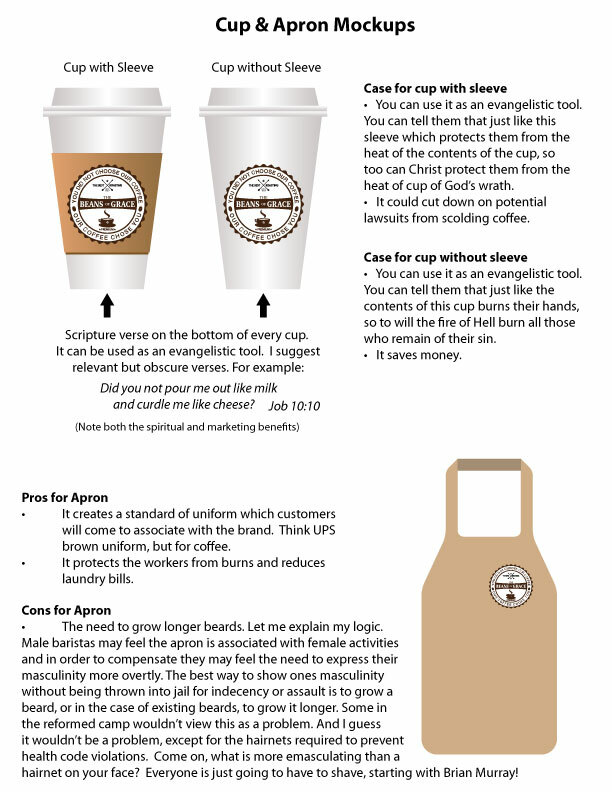 I hereto propose that Grace Presbyterian Church should open up a coffee shop to the Glory of God. If you brew coffee, sinners will come, thus making our evangelism more efficient. They will also bring their money with them (Prov 13:22b), thus helping fund further propagation of the gospel. In addition saint and sinner alike will be enjoying God’s creation of coffee, thus promoting his Glory. I’d love to be a fly on the wall at that meeting if he actually brings it forward. I love this. Exactly what this town needs. I am sure with the connections you have there, you would be a shoo-in if you were looking for a job as a barista.